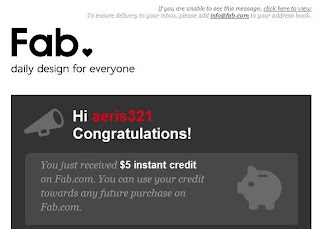 FREE $10 Credits Every Month from Fab.com! Get Free Home Decor, Gifts, Clothes + More! 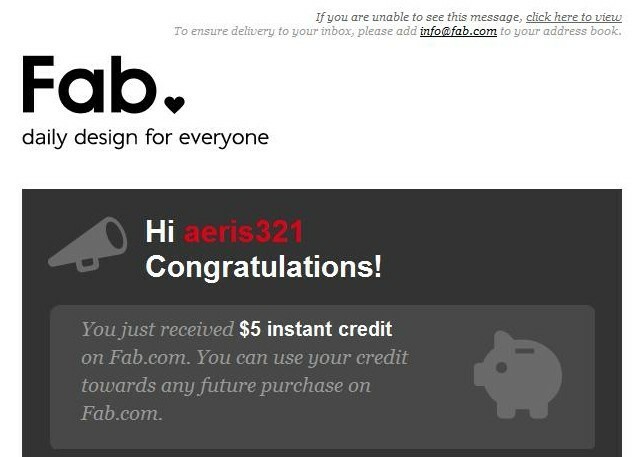 UPDATE: I just got 2 emails saying I received $5 in credits, yay! 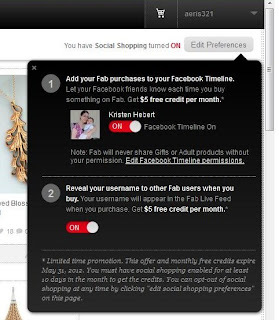 Fab.com has just put out a promo where if you enable your "Social Shopping" feature, they will give you up to $10 in site credit for free every month! They frequently sell products for $10 or less, so you can easily score free home decor, unique gifts, toys and more! For $5 a month, all you have to do is add your Fab purchases to your Facebook Timeline (you'll need to put the Timeline feature on your FB if you haven't already). And for an extra $5 a month, you'll just have to allow them to share your username with other Fab users with each purchase you make. Enable one or both options and you're good to go! Click here to visit Fab!